Chicken Sopas is the ultimate comfort food! 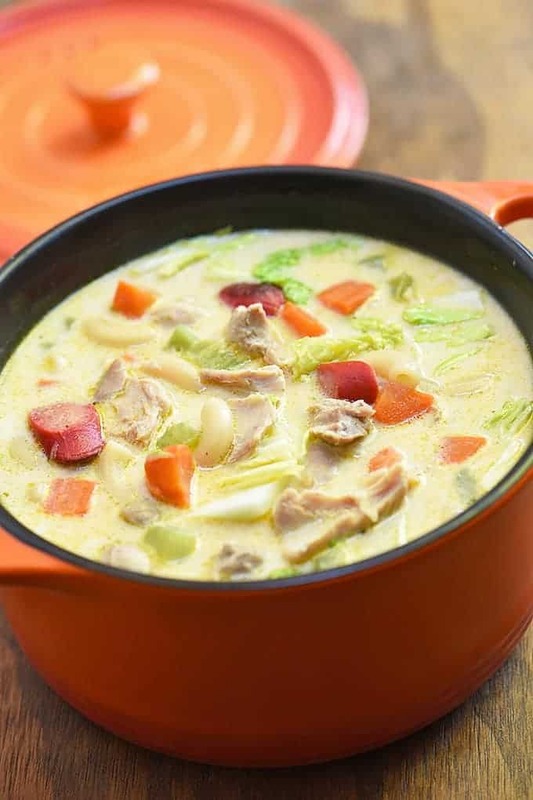 With chicken, macaroni, vegetables, hot dogs, and flavorful broth, this Filipino-style soup is creamy, delicious, and the best way to warm up on cold winter days. This chicken sopas was originally not on my countdown list, but I came across a post in a recipe group on Facebook from a Filipina asking what will go well with sopas for Christmas. I can’t believe I didn’t think of this Filipino soup when I was planning my holiday posts! I mean, seriously, what can be more comforting and satisfying than a piping hot bowl of chicken soup on a chilly Christmas day? Well, maybe a piping hot bowl of sopas AND cheese puto. 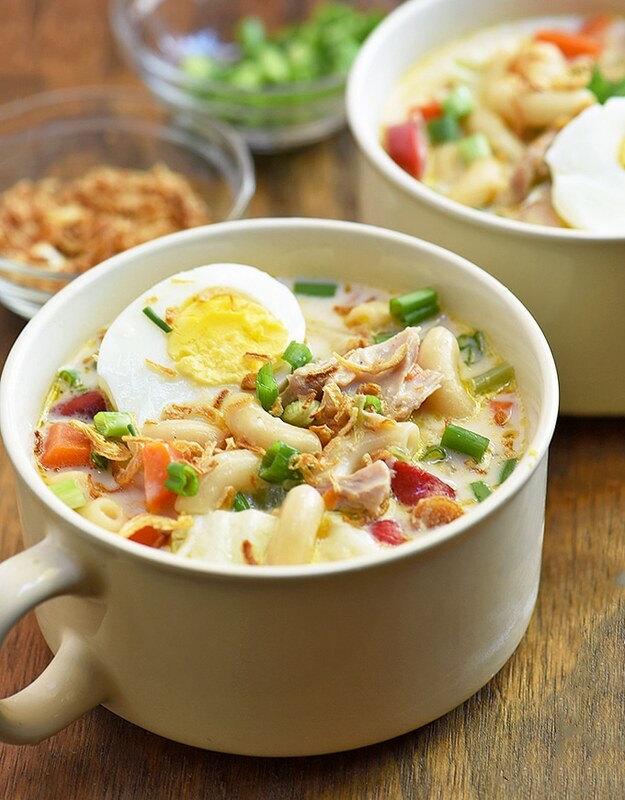 Sopas, which literally means soup, is an integral component in the Filipino cuisine. But although there are many dishes we can classify as sopas such as pancit lomi and chicken sotanghon, it is most commonly associated with a soup made of elbow macaroni, vegetables, and milk-infused broth. While flaked chicken is the most popular protein ingredient, other meats such as ground beef, diced pork or even corned beef are also used to make this soup. For my version of this chicken macaroni soup, I usually start with sauteing mirepoix as the base. This combination of onions, celery, and carrots not only serves as the added vegetables in the soup but brings tons of flavor as well. As in any good soup, the heart of this recipe is the broth. Boneless chicken might be more convenient, but for a full-bodied taste, I recommend using bone-in. I like to gently simmer the chicken in aromatics until cooked through and flake the meat. I then return the bones to the pot and simmer for at least 30 minutes to an hour to draw out their flavor. This step takes a bit more time but I promise your extra effort will be rewarded with a more robust flavor. The recipe calls for carrots, celery, and napa cabbage as the vegetable add-ins but you can add or swap diced potatoes, green peas, and kinchay (Chinese celery) if you like. Hot dogs are a classic addition to sopas, but you can also use cubed ham, Vienna sausages, or liver. The macaroni is cooked directly in the soup and the extra starch will thicken the broth nicely. If you prefer a thinner consistency or the soup begins to thicken over time, just dilute with additional water as needed. Since the question “what to serve with this soup” is what had me updating and reposting this recipe, let me share with you how I set it up for a large crowd. When the soup is ready, I transfer it to a crockpot or a chafing dish to keep hot throughout the party. 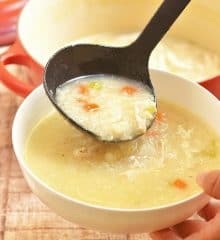 As I love to round off the soup with extra trimmings, I place individual mugs to serve it in and small containers of chopped green onions, hard-boiled eggs, and fried shallots or fried garlic bits by the crockpot so guests can garnish their bowls to their liking. The sopas is filling on its own but for a heartier meal, I usually complete it with sides of puto, warm pandesal, saltine crackers, and tasty bread. As pasta tends to absorb a lot of liquid, drying out the soup over time, I keep a pot of the creamy broth simmering on the stove to quickly replenish the soup as needed. I also like to undercook the noodles a little so they don’t turn too mushy. 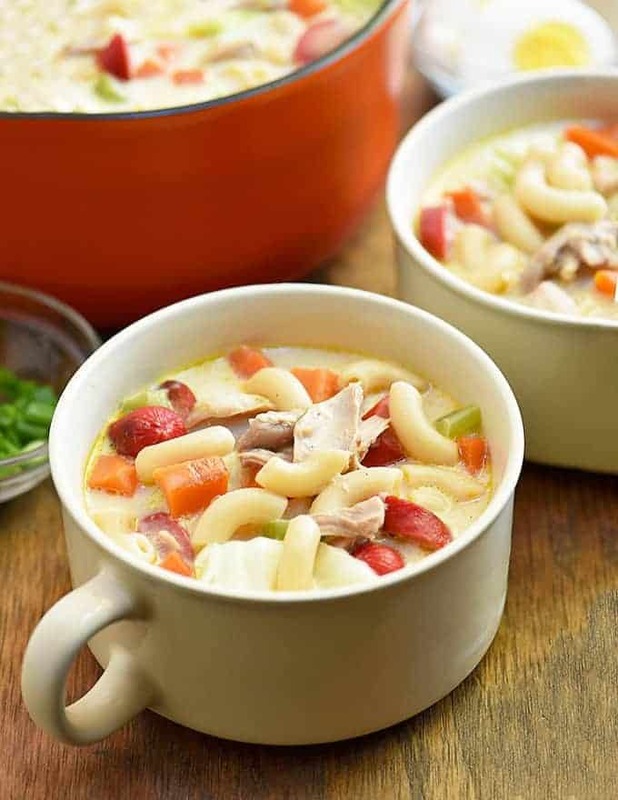 If you’re serving the chicken soup at a later time, you can cook the macaroni separately and just add to the sopas when ready to serve. In a large pot, combine chicken, quartered onions, peppercorns, garlic, bay leaves, 1 tablespoon of salt, and 10 cups water. Over medium heat, bring to a boil, skimming scum that may float on top. Once the broth clears, lower heat and cover. Continue to cook for about 20 to 30 minutes or until chicken is cooked through and fork-tender. With a slotted spoon, remove chicken from the broth. Allow chicken to cool to touch, pull meat from the bones, shred and set aside. Return the bones to the pot and bring to a boil. Lower heat, cover, and simmer for at least 30 minutes to 1 hour. Using a fine-mesh sieve, strain Using a fine mesh sieve, strain broth to remove sediments and reserve about 8 cups. In another pot over medium heat, heat oil. Add hot dogs and cook, stirring regularly, for about 1 to 2 minutes or until lightly browned. With a slotted spoon, remove from pan and drain on paper towels. Keep warm. Add macaroni and cook, stirring regularly, for about 1 to 2 minutes. Add the reserved broth and bring to a boil. Lower heat and simmer, stirring occasionally, for about 8 to 10 minutes or until pasta is tender. 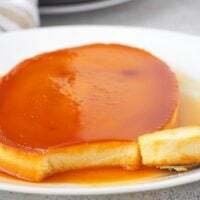 Add evaporated milk, shredded chicken, and hot dogs. Continue to cook simmer until heated through. Season with salt and pepper to taste. Add napa cabbage and cook for about 1 minute or until tender-crisp. To serve, ladle soup in individual bowls and garnish with eggs and green onions, if desired. Serve hot. Is it possible to actually cook it in the crockpot Ate? Trying this recipe today, from a rainy, cold day in NYC, and I’m very much looking forward to it. For what it’s worth – I hope you keep sharing your stories and how you came to use the recipe you post; if there are people out there who just want the recipe and don’t need the story, they can spend the two seconds it takes to scroll down and go directly to the ingredients list and directions. I’ll share pictures and results later today! I like all your recipes, but I hate reading your intros. the cursive font makes them hard to read. So I don’t bother and go straight to your recipes. I am working on changing the font so please bear with me. Here in the province, chicken sopas is also served on lenten season during ‘pabasa’. And tomorrow, we are going to cook this for breakfast for the death anniversary of my uncle. I will be in-charge of this, as requested, that is why I am keeping my fingers crossed. Whew! I need to ready my printout then. (~wink~) Btw, 10 cups (water?) Thanks! No you didn’t corrected it yet. I need to have some of this before winter completely goes away, if only I can fix my schedule to do so. I need to cook it before January 2015 is over. It’s no fun serving this on a hot season.